The 'printer' drivers work by pretending to be a printer - your word processor or whatever you are using sends the data that is required to what it thinks is a printer but instead, the driver collects the data and turns it into a PDF file. This emulates the process on UNIX/Linux/*BSD systems where you can print from any program that will print to the PDF file driver. So, what is the better alternative? OpenOffice.org will print directly to PDF including any watermarks without you having to have a special printer driver. This is especially useful in Windows environments where a PDF printer is not part of the normal system. In short, anything you can put on a page can be printed to PDF with OpenOffice.org. If you are concerned about compatibility issues using OpenOffice.org, it will import your legacy Microsoft files and print those out for you although you will probably like to go over to OOo eventually for its licensing and cost benefits. XMMS is skinable and you can make your own if you really want to. All you need to do to add a skin is to go to the xmms skins download page at http://www.xmms.org/skins.php and download those of your choice. Save the file in /usr/share/xmms/Skins/ and they will show in the skins browser - there is no need to unzip them. The one on the right is based on the OS X theme on the Mac but you are not limited to this. If you do want to make one of your own, you can look at the image files in the tar.gz file. You will also need to look at the files that contain the rgb information for the analyser and scope and set them - one is in hex which is easy to separate into rgb values and the other has the rgb values as decimal. One tool for getting just the right colours is the GIMP which has the colour picker and also, if you click on the colour in the palette, you will get a colour dialogue which should give you what you need. You can make your own design as original as you like but just to show you what can be done by changing as little as possible, I made the variant on the right, for *BSD. I started off by cloning out Tux and replacing him with the BSD Daemon using The GIMP. Then, I rotated the colours so that it took on the red scheme that you can see on the right. You can get that skin by clicking on this link and following the instructions at the beginning. If you double-click on the file KillCapsLock.reg in this link, it should open up with Regedit and add to your system so that the Caps Lock Key will no longer lock - it will work like the ordinary shift key. This is XP only as far as we know but if you throw caution to the wind and take the devil-may-care line, you might want to try it with Windows 2000 but don't come crying to us. It is true that MP3 has little of the quality that Ogg Vorbis has for the same file size - in fact, if you compress the same wav file using MP3 and Ogg Vorbis, you will always end up with a larger MP3 file for a similar quality. One other thing to note is that MP3 is a lossy compression in a similar way to Ogg Vorbis. However, each of these compression techniques throws away a different part of the data file to the other so, if you were to compress a sound file using Ogg Vorbis and then expand that file and re-compress it using MP3, the resulting file would be doubly degraded. Note that this would happen whichever one you used first. Another point worthy of note is that MP3 has a patent on it so every time you download an MP3 file, some of your money goes to the patent owners. Ogg Vorbis was designed so that there were no patents to infringe and no fees to pay. So, if Ogg Vorbis is better than MP3 and it is free, why convert to MP3 instead of Ogg Vorbis? The answer is simply that, at the moment, the people who make personal stereos of the USB variety generally do not include Ogg Vorbis as a file type that can be played. If you are going to get one of these players, you should try to get one that has Ogg Vorbis compatibility on it already or get one that you can update the BIOS with so that in the future, it will be able to play Ogg Vorbis files - sooner or later, the music industry will cotton on to the fact that they can make better quality, smaller files that don't cost as much by abandoning MP3 for an open format like Ogg Vorbis. So, if they are both lossy, why convert from Ogg Vorbis to MP3? If you have already converted your songs to Ogg Vorbis and intend to play them on a personal stereo, any quality loss caused by re-conversion is not going to be that significant. If you have songs that you have not yet converted to Ogg Vorbis, you should convert them to MP3 directly - also make an Ogg Vorbis copy so that you can stream it across your home LAN as this works better than MP3 does. To create an MP3 file - either from an Ogg Vorbis file or a wav file, you will need an encoder like Lame. First of all, you need to download the source from http://lame.sourceforge.net/download/download.html and be sure to click on the 'important message from the RIAA' link and read it. Next, go back and click on the 'Source Code: Click here ...' link and then on the 3.96.1 (or higher) link that ends with '.tar.gz', which will take you to the SourceForge.net download server. Choose a mirror and click on the download link. The '.tar.gz' should be saved to wherever you decided to put it (putting it on the Desktop makes things fairly straightforward). The following is reasonably easy if you are using a windows manager such as KDE. ... which will configure, compile and install the program. This process might take a few minutes but you know that at the end of it, you will have the MP3 encoder compiled for your own system rather than having some generalised version of it that might have system specific incompatibilities within it. Now that you have your .mp3 encoder, you need to have a program that will take your .ogg files and convert them to .mp3. Usually, if you want to perform a conversion from one format to another, you can usually find a program with a name made up of the two file extensions with the number two between. A quick look on Google shows a program (a Perl script by Mark Draheim) called 'ogg2mp3' (http://amor.cms.hu-berlin.de/~h0444y2j/linux.html) which has a download around half way down the page (Files... Just the script). ... and, if all has gone according to plan, it will start munching its way, recursively through your directories of .ogg files, translating them to the same file name but with the .mp3 extension. However, you will probably find that you need to do more first and the clues are in the ogg2mp3 program script. If you open it up in KWrite or Kate, you will see that there are a number of things that need to be present: the files 'ogginfo' and 'ogg123' need to be in '/usr/bin/' which they already should be as you have generated your own .ogg files already; and, you need to make sure that 'lame' which you have just compiled is also in '/usr/bin/', or that you alter the line in the Perl script that tells the script where to expect to find it. If you are missing a Perl module, look at the sidebar on the right. With all of the locations correct and the correct modules installed, ./ogg2mp3 will now work away recursively (although not necessarily in what we might think is a logical order) until they are all converted. If you have a fairly extensive collection, you might want to think more about preparing a four course meal than making a cup of coffee whilst you wait. Once it is finished, you will have an .mp3 and .ogg copy of each song in your directories. To make using your MP3 player easier, it is best to have the MP3 files in separate directory so, if you have .ogg and .mp3 directories with all of the album directories within those, you can use them easier. Using the MP3 player is now a matter of: plug it into the USB port; mount it (usually as sda1 or similar); open up Konqueror; delete any files/directories you don't want and then copy any new ones across; unmount the USB; and, unplug it. One thing to be aware of is that USB MP3 players are effectively flash disks and as such, use 'vfat' (FAT) as the file system (so that they will work with Windows machines). The only problem you are likely to encounter with this is if you use camel notation for otherwise identical file names so 'NotHere' and 'NoThere' are the same under vfat. One problem that you might find is that, if you have only the very basic installation of Perl, you might not have the Perl modules installed on your system that you need in order to use ogg2mp3, namely: File; Getopt; and String. If you cannot find these on your system installation discs, you can find them at CPAN (on SuSE Linux 8.2, the only one you will need to download is String) which is at www.cpan.org or you can find the RPMs at the RPM Repository (http://rpmfind.net/linux/RPM/CPAN_String.html to download the 'String-ShellQuote module'). 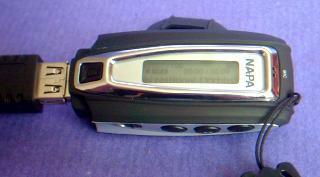 The question still remains about which MP3 player to get. Size is one issue but there is also one about the types of files it can read. First of all, size. For an eight hour shift, you will need around 400MB of space (remember that you will only be working for 7.5 hours) and also, you have the luxury of being able to delete and copy any selection you like so changing the songs that you listen to will be a lot easier. The drives that are available tend to go up in multiples of two so a 512MB MP3 player will have plenty of space. If you are planning to get a 1GB or even a 2GB MP3 player, one thing that goes in its favour is that when you turn them back on again, they remember where you left off, so you are not left scrolling through hundreds of tracks, trying to find one that you have not listened to recently. One word of warning though is that when the battery runs out (this is one of those technologies where it has all become so small that even the single AAA sized battery weighs almost as much as the rest of it) it only remembers where it was when it was last switched off which could be as much as six hours ago. File types are another matter. Each time a music vendor sells an .mp3 track, they are responsible for paying Fraunhofer a percentage of each sale for using their patents. Ogg Vorbis is patent and license-free and as the quality for a given file size/bit rate is demonstrably better, it is only natural for music vendors to move over to .ogg given time. Therefore, you are really better off getting an MP3 player that can have its firmware updated so that it includes Ogg Vorbis codecs. Apart from better quality with Ogg Vorbis, you will be able to get more music on there and if you buy music online, there is the potential for the savings in licensing to be passed on to the purchaser although with this latter point, I wouldn't hold your breath waiting.